Rent by the day, weekend or month! The market is a place where a person can start a weekend business for an overall cost as low as $205 per month with an already established traffic flow. Approximately 550 - 750 customers come through the market each day. All vendors are required to pay a monthly charge of $20 that goes into the advertising (over and above what the market pays for). It is like co-op advertising. The vendor gets an already established traffic flow for only $20 per month. There is a $5 per weekend charge or $20/month for the "vendor run advertising fund." Daily & monthly rentals include GST. 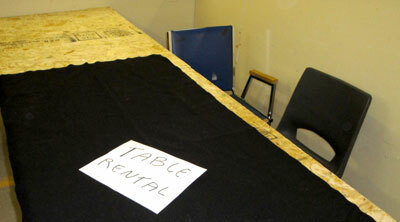 There are extra tables & larger areas when available at various rates.